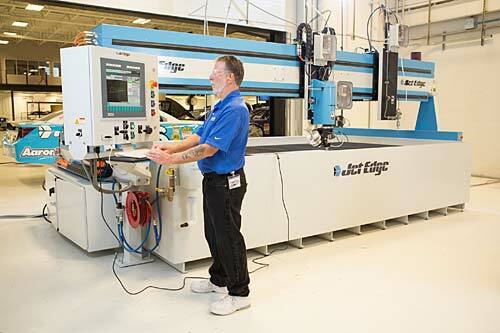 Jet Edge, Inc. has announced that its longtime UK distributor Aquablast Ltd. has installed a Jet Edge EDGE X-5® 5-axis waterjet cutting system at its headquarters in Beccles, Suffolk, United Kingdom. Capable of cutting sophisticated 3D parts and bevels up to 60° from virtually any material, Aquablast’s Jet Edge 1,500 x 4,000 mm (5 x 13 feet) abrasive waterjet system is designed for 24/7 industrial use and maintains ±0.025-mm (0.001-inch) linear positional accuracy over 300 mm (12”) per axis and ±0.025-mm (0.001-inch) repeatability (bi-directional). Aquablast has represented Jet Edge waterjets for more than 20 years and has extensive knowledge of ultra-high pressure waterjet technology and its countless applications. In addition to representing Jet Edge, Aquablast also manufactures its own line of waterjetting equipment and carries a wide range of mobile waterjet systems and support products. The company also offers precision waterjet cutting services, mobile waterjet cutting and surface preparation services, and safety training. Aquablast is authorised to sell and service Jet Edge’s full product line in the UK, including Jet Edge’s CE-marked 5-axis and 3-axis waterjet motion systems, its hydraulic intensifier and direct drive pumps, and portable cutting systems and water blasting equipment. Jet Edge offers the widest range of waterjet pumps in the industry, from 36-280 hp, in 2500 bar (36 KSI), 4000 bar (60 KSI) and 6200 bar (90 KSI) models, electric and diesel. Tags: Aquablast Ltd., Jet Edge Inc.